USPAS Director Bill Barletta (left) and NIU’s Mike Syphers. Michael Syphers, a senior research professor of physics at NIU, received quite a surprise when he traveled recently to the University of Texas, Austin, to teach a course for the U.S. Particle Accelerator School (USPAS). Syphers has taught similar USPAS courses for nearly three decades with little fanfare. 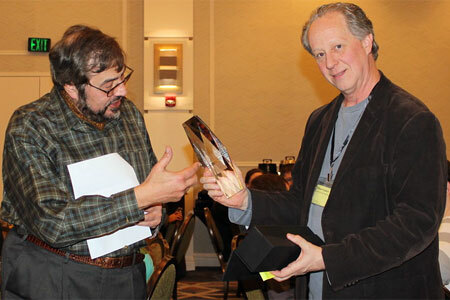 During the school’s opening night ceremonies Jan. 24, the organization honored an unsuspecting Syphers with a special award for his exceptional contributions in teaching at USPAS sessions. “We call it the Iron Man Award – it’s the first time we’ve given it out,” says Susan Winchester, USPAS manager, adding that both Syphers and Fermi National Accelerator Laboratory’s Don Cossairt were given the service awards. One of those big names is John Byrd, program head of the Center for Beam Physics at Lawrence Berkeley National Laboratory in California. As a Ph.D. student at Cornell University in 1988, Byrd was working on experimental particle physics when he took a USPAS course co-taught by Syphers. After completing the course, Byrd went to his advisers and told them he wanted to change his field of study to accelerators. “I finally felt like I had found what I wanted to do,” Byrd says. 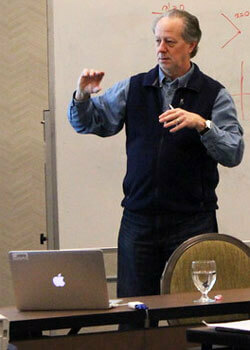 Michael Syphers teaching a course at the most recent U.S. Particle Accelerator School held at the University of Texas, Austin. USPAS provides graduate-level training and workforce development in the science of particle beams and their associated accelerator technologies that are not otherwise available to the scientific and engineering communities. Twice a year, the organization conducts two-week-long graduate and undergraduate level courses at leading U.S. universities. Since it began in 1987, the school has trained thousands of people from across the world in accelerator technology and design. Syphers has been with the school since 1988 and has taught more than 500 students. He also co-authored a textbook, “An Introduction to the Physics of High Energy Accelerators,” which was first published in 1992, has become a standard in the field and is used in USPAS courses. “It is a matter of extreme pride and honor for the beam physics group in the NIU-Fermilab accelerator research cluster, for the Northern Illinois Center for Accelerator and Detector Development in the Department of Physics and for the entire NIU community to have an active research colleague honored for pedagogy in such a national forum. We can only aspire to grow from here,” says Swapan Chattopadhyay, professor and director of accelerator research at NIU and a member of the senior leadership team at Fermilab. Syphers came to NIU in September, accepting a joint appointment with the university and Fermilab. Previously, he served for five years as a physics professor at Michigan State University. Before that, he had a long career as a scientist at several U.S. National Laboratories, predominantly at Fermilab. “I came to NIU as a research professor to help engage NIU students in accelerator science and promote the field, building upon my strong ties with Fermilab,” Syphers says. He added that he has always been interested in education. Before entering academia, USPAS fed this passion.